Every day, thousands of new denture wearers receive new teeth without knowing how to care for them. Midtown Dentistry is changing that with an interactive "clean denture" drive. Getting new teeth is both exciting and scary. Dentures have a huge psychological and physical impact on their owners - they cause immense discomfort and are analogous with old age. The only major improvement they can give a person is in the cosmetic result - how they look. But the cosmetic improvement diminishes as the denture gets stained and discolors due to poor maintenance. The end result is an unpleasing prosthesis that is ugly and uncomfortable. 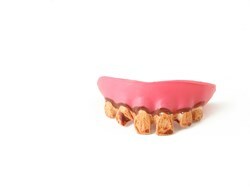 How to care for dentures is a major part of keeping the positive aspect - the looks - at top shape. The problem has been the lack of clear instruction on how to care for dentures. Midtown Dentistry has just released video animation, written instructions and a book on caring for dentures. This "clean denture" drive intends to promote the need for specific denture cleaning awareness in the public. It allows other dentists to use our information and disseminate it to their patients.